It has no cross activity to other members in the IL-1 receptor family. The pro-inflammatory cytokine IL-1 induced cellular response requires two subunits of its receptor, IL-1receptor I (IL-1RI) and IL-1 receptor accessory protein (IL-1RAcP). IL-1RAcP forms a complex with IL-1RI inresponse to IL-1 treatment. The IL-1 receptor-associatedkinase (IRAK), which mediates activation of NF-kBinducing kinae (NIK) and of NF-kB, recruits to the IL-1Rcomplex through IL-1RAcP. IL-1 activation of stress activated protein kinase and of acid sphingomyelinase also requires IL-1RAcP. 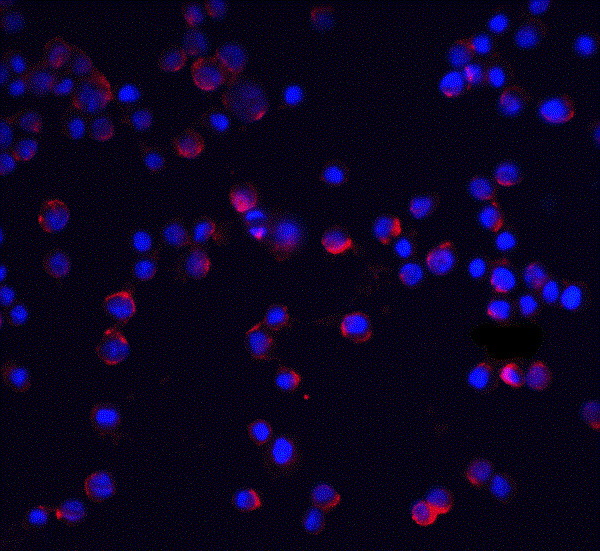 Like IL-1RI, IL-1RAcP subunit is essential for IL-1 mediated cellular response. IL-1RAcP is expressed in many tissues. Our Abpromise guarantee covers the use of ab8110 in the following tested applications. WB 1/1000 - 1/2000. Detects a band of approximately 66 kDa.Can be blocked with IL-1RAcP peptide (ab6104). Coreceptor with IL1R1. Associates with IL1R1 bound to IL1B to form the high affinity interleukin-1 receptor complex which mediates interleukin-1-dependent activation of NF-kappa-B and other pathways. Signaling involves the recruitment of adapter molecules such as TOLLIP, MYD88, and IRAK1 or IRAK2 via the respective TIR domains of the receptor/coreceptor subunits. Recruits TOLLIP to the signaling complex. Does not bind to interleukin-1 alone; binding of IL1RN to IL1R1, prevents its association with IL1R1 to form a signaling complex. The cellular response is modulated through a non-signaling association with the membrane IL1R2 decoy receptor. Secreted forms (isoforms 2 and 3) associate with secreted ligand-bound IL1R2 and increase the affinity of secreted IL1R2 for IL1B; this complex formation may be the dominant mechanism for neutralization of IL1B by secreted/soluble receptors. Detected in liver, skin, placenta, thymus and lung. Belongs to the interleukin-1 receptor family. 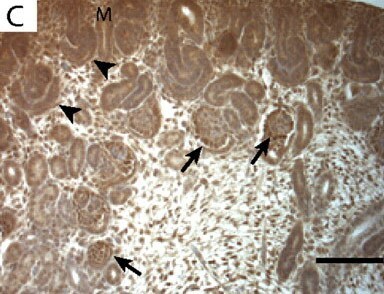 Immunohistochemical analysis of rat embryonic kidney tissue, staining IL-1RAcP with ab811 at 1/1000 dilution. Antigen retrieval was carried out by microwave oven in a citrate buffer. Publishing research using ab8110? Please let us know so that we can cite the reference in this datasheet. There are currently no Customer reviews or Questions for ab8110.